October | 2013 | Happy Bubs. Happy Mums. IRON is a vital mineral for body function and good health. Iron is needed to make red blood cells, which carry oxygen around the body. It is also important for growth, development and fighting infections. Some children do not get enough iron and become tired, faint, pale, poor sleepers, low appetites and uninterested in ‘playing’. If the body does not get enough iron from food it may result in anaemia. Kids between 1-3years are at most risk of developmia. Most toddlers are no longer consuming iron-fortified formula and infant cereal, and they are not eating enough iron-rich sources to make the difference. Also, toddlers tend to drink a lot of cows milk and drinking too much can injure the stomach lining causing chronic blood loss in stools. To improve blood iron levels it is recommended that everyday you eat a variety of foods that contain iron. 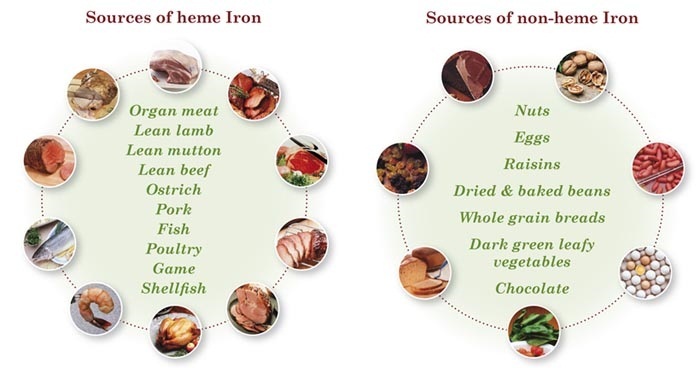 There are two types of iron found in foods..the haem (the good stuff!) and the non-haem (good…but not great!). Lean red meats such as beef, lamb and veal. Offal meats such as liver and kidney. Chicken, pork (including ham), fish and shellfish. Iron-fortified breakfast cereals (check the label to see if iron is added). Dried peas, beans and legumes eg. lentils, baked beans, soybeans, kidney beans and tofu. Leafy green vegetables eg. spinach, parsley, broccoli. Peanut butter and nuts (whole nuts are not recommended for children under five). Milo® or Ovaltine® for older children. TIP: When eating iron, try to pair it with vitamin C, it will help maximise absorption in the body. Foods high in vitamin C include fruits (esp. citrus fruits..oranges, rock melon, kiwi fruit, strawberries or tomatoes), vegetables (broccoli, cauliflower or capsicum). Why not add fruit to breakfast cereals, veggies or salad with meat?? ?